Nested, the estate agent that helps you buy your new house before you’ ve sold your old one, has raised £36 million in its latest funding round led by Global Founders Capital. The funding represents Europe’ s largest PropTech investment this year and is the third round of funding secured by Nested within 18 months, bringing the total amount raised to almost £50 million. Nested, launched in January 2017, is an estate agent that provides home sellers with up to 97% of their property’s value when they need it, and the rest when it sells. The home seller can thus use the funds advanced by Nested to buy their next home before selling their old one. Nested will market the home, find a buyer and, irrespective of how long the sale takes, the home seller will receive the total sale amount of the home (minus Nested’s fees) upon completion. In doing so, Nested breaks property chains and gives vendors the same market power as cash-buyers. Nested was co-founded by established entrepreneur, Matt Robinson, who previously co-founded the successful online payments company, GoCardless. Matt Robinson, CEO of Nested, comments: “This latest round of funding is recognition of the demand we’ve seen from home sellers in London. We’re already guaranteeing tens of millions of pounds worth of homes each month, and are delighted to be helping so many people with what is one of the biggest transactions any of us make in our lifetimes”. Matt Robinson continues: “Anyone who has ever sold a home in the U.K. knows that the system is broken. The typical sale involves months of stress with 1-in-3 sales falling through. Worse still, home sellers don’t know the only two things that matter – how much they will sell for and when they will receive the money – until after their property is sold. With Nested, both of these are guaranteed from day one saving sellers months of stress without needing to compromise on end sale price. We fully anticipate being people’s preferred way to sell their home in the coming years. Based on current demand, we expect to be doing 1% of London home sales in the next few months and 5-10% in the next year”. Nine-in-ten of Nested’s customers have previously been on the market with other estate agents, and have been left frustrated by poor service and broken chains. Rachel Macauley and her partner Jonathan Vyse were planning a move to Edinburgh, and had been trying to sell their home with Purplebricks. After two sales collapsing, they discovered Nested. Rachel comments: “The most important thing for us was the guaranteed sale that Nested provided. After all the setbacks, we could finally put firm plans into place to move up to Scotland without worrying that the sale would fall through again”. Nested guaranteed their sale so the couple had the certainty they needed to move to Edinburgh. Even better, thanks to superior service levels, Nested sold the home for a higher price than the prior agent had achieved, with Rach and Jonathan receiving the extra above their guarantee. This is the norm with Nested typically guaranteeing between 95% and 97% of the home’s target sale price and then going on to sell for an impressively accurate 100.0% of the target sale price. Unlike other agents, Nested use detailed data analysis, both machine and human, to produce valuations with market-leading accuracy. With this new funding, Nested plans to continue its aggressive growth, initially within London and in the near future expanding across the U.K. The investment will focus on delivering a solution that provides home sellers with absolute certainty and a refreshing customer experience that far exceeds what’s common within estate agency. 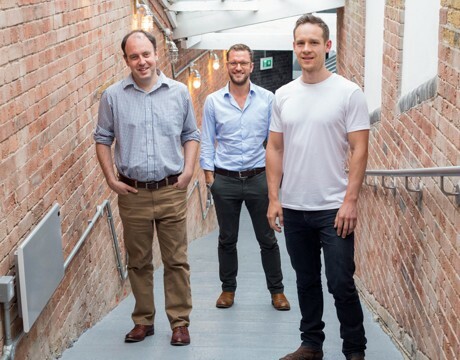 Launched in January 2016, Nested was founded by entrepreneur and former McKinsey consultant Matt Robinson, alongside ex-Songkick CTO Phil Cowans and trained architect James Turford. Previous to Nested, Matt was the co-founder of GoCardless, a direct debit payments startup which has raised more than £40 million and transacts more than £3 billion per year, where he remains on the board.